Due to high thermal resolution (number of pixels) the Thermal Expert Imagers show more details in the picture than other thermal imaging cameras with lower thermal resolution. The excellent thermal sensitivity allows to detect even minor differences in surface temperature. 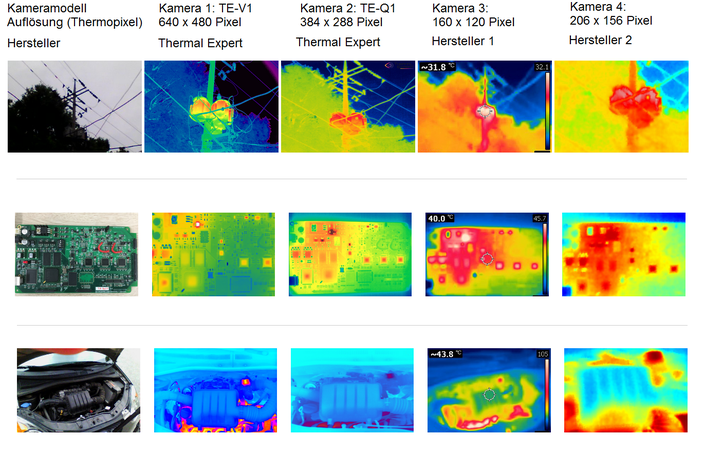 The Thermal Expert cameras can be used on a Windows PC and Android smartphone or tablet. The software is easy to understand for thermal imaging beginners and allows thermal imaging and video recording, temperature measurement and much more. You need to process the data of the thermal imager yourself? Supplied drivers allow easy integration into your system. Drivers and a powerful API are available for Windows, Linux and Android for fast integration into your applications. Access to the image raw data is possible. A shutter is used to calibrate the image sensor to compensate for the drift of the image sensor. The shutter is a mechanical component and covers the image sensor for a fraction of a second. For image sensors with large sensor drift, the calibration sometimes has to be done in one-second intervals, which leads to image freezing and is often associated with a disturbing mechanical click. The image sensor of Thermal Expert has a very low drift and therefore does not require a shutter during operation. Thus, a continuous video stream can be recorded and sensor data can be transmitted for real-time applications with up to 30 Hz frame rate. The exchangeable lens allows the camera to be used both in close range and in the far range. Thus, with a Thermal Expert thermal imaging camera several purposes can be covered at once.